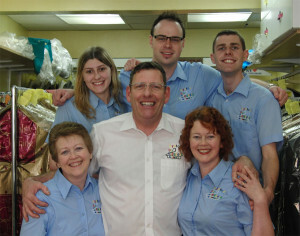 We are a small, independent, local family-owned dry cleaners & laundry business. All our work is carried out on-site and this is rare these days, and in fact we are the only dry cleaners and laundry business in the local area that offers this service. We employ a fully trained, knowledgeable, and friendly staff force, many of whom are family members, who are passionate about what they do. Each employee strives to provide an excellent personal customer service and top quality work, with attention to detail that is second to none. We use the best technology and products available on the market to ensure excellent results every time. Once you start using our services you will find that your individual needs as a customer are first and foremost in our minds. We are confident this approach works as we have an extensive customer retention base that continues to grow. We strive to improve our already excellent customer service and aim to offer excellent value for money. So please don’t hesitate to contact us to discuss your individual requirements.